WE LOVE THIS!! As a new parent, you want to do so many things and this baby growth chart by Rag and Bone makes it sooo easy for you!! Add love and watch your children grow. Chronicle your little one's growth and development throughout the years with a Rag & Bone growth chart. Charming & cute and stylish enough for your modern home. Includes height and date entries as well as places for photographs. Photo mounts are included. Size is 8" x 40", measures 26" to 60". Available in the Little Birdie patterns only. 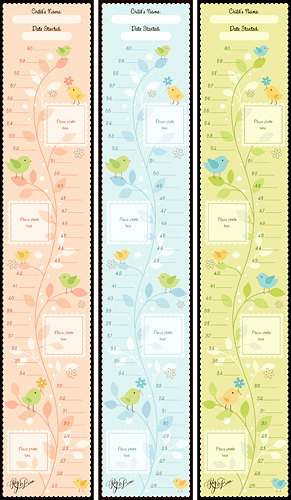 Growth Charts match our Little Birdie Baby Books!